Shown below is a sample of Hindu wedding card wordings in English for inviting guests for their courteous presence on your grandson wedding. 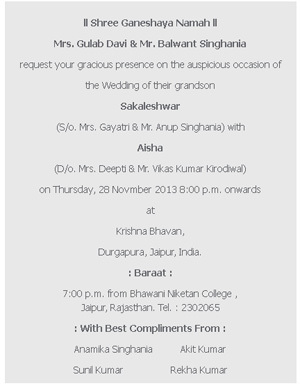 You can use the Wedding Card Wording examples in invitations for inserting text in the matter for Grandson Wedding Card. As of the Indian Census of 2011, almost 80% of the Indian population is marked as Hindus. Therefore, Hindu weddings are a common scene in the Indian community. And owing to the percentage of Indian Hindu families living abroad, the frequency of Hindu wedding ceremonies has gone global too. Therefore, if you too are planning on a grand Hindu wedding ceremony, you must be aware of the rich etiquettes and rituals of Hindu wedding invitations to start off. If we consider Hindu wedding invitations wordings, you will find that there are a few common norms for writing them and you can not just go haywire in excitement. Below are a few guidelines about writing Hindu wedding cards. The basic advantage of a wedding card is that with the proper use of words you can easily set the mood of the ceremony very much in advance. So, when your guests receives a wedding card designed and written strictly keeping in mind the norms of Hindu culture, they will exactly know what to expect on the big day. 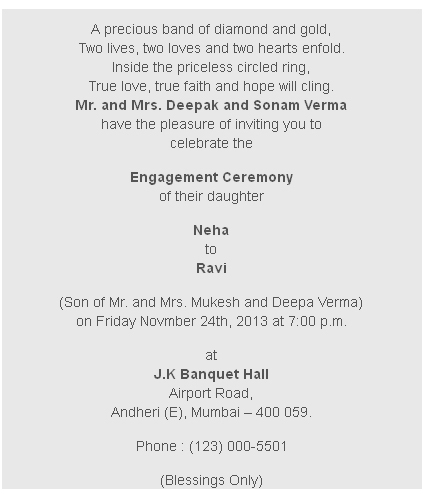 Below are few of the most useful tips on writing Hindu wedding invitations. Have a look! 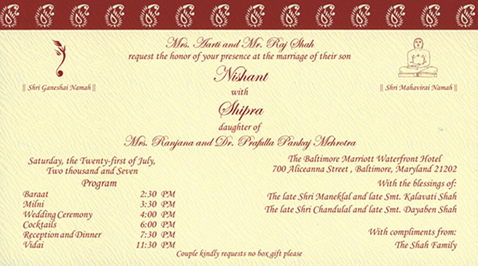 Clearly mention the date, time and venue of the marriage ceremony in your Hindu wedding invitation card. 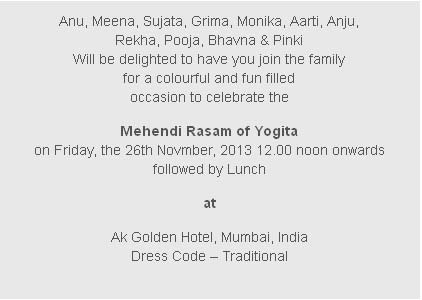 Since, Hindu wedding event usually lasts for more than one day, specifically mention all dates of invitation too. And yes, when writing the date, don’t forget to include the year. Say for example, instead of January 2, you may write Wednesday, the First of January, 2012. 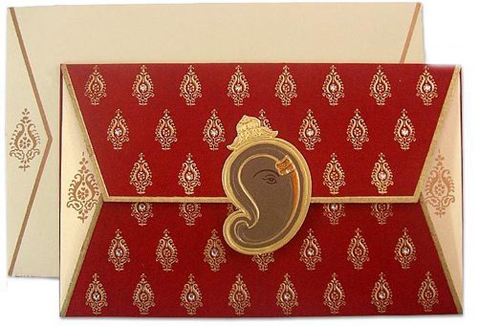 Also, it is basic etiquette to write eight o’clock in the evening, instead of writing 8 p.m.
Hindus also use religious icons of Hindu deities such as icons of the auspicious Lord Ganesha on top of the card. You may also use some religious quotes on Hindu wedding cards for the touch of tradition. We have the full range of customizable Christian wedding invitation wording for your guest to be present on the auspicious day. 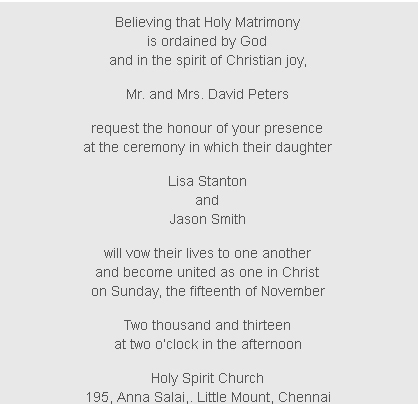 A sample of Christian Wedding card wording in English is given below showing the cordial way of inviting your friends and families to attend your wedding. Make your Cocktail party invitations sound fantastic and attractive with our Cocktail Card Wordings. Just type the text and leave the rest to us. 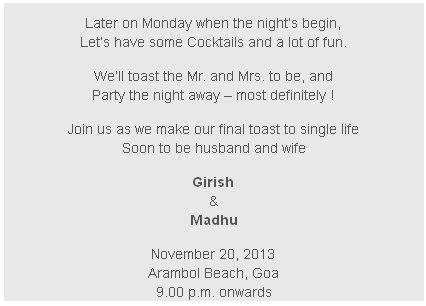 Below is a sample of our Cocktail party invitations wordings in English for the gracious presence of your invitees. Let’s have some Cocktails and a lot of fun. Party the night away – most definitely ! Select your favorite birthday card wording from our beautiful messages that shows your excitement for your upcoming birthday. 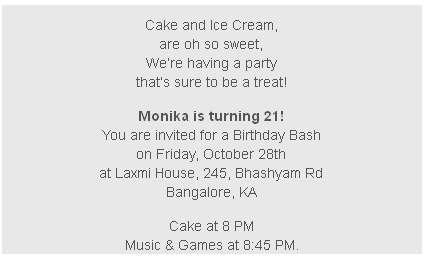 Here is a sample of a Birthday Invitation Wordings in English for inviting your friends in a wide range of manners. that’s sure to be a treat! Music & Games at 8:45 PM. Gracefully invite your friends and families on your Engagement party with the right message to show the right emotion hidden. Just insert the text and we will take care of the rest. 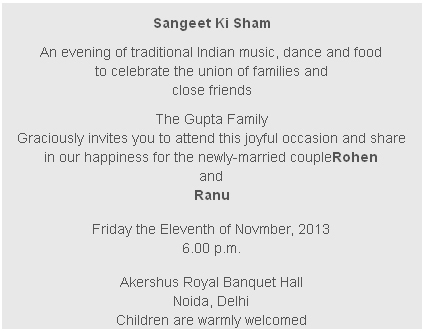 Below is a sample of our Engagement Card Wordings in English that shows how cordially your invitees can be invited. Two lives, two loves and two hearts enfold. True love, true faith and hope will cling. on Friday Novmber 24th, 2013 at 7:00 p.m. Anniversary Card Wordings are made easier with our service. Insert your text and we will look after delivering the right sentiments to your invitees. Given here is a sample of our Anniversary Invitation Wordings in English by mentioning about your friends in the card. A lifetime of caring, sharing. . .
A love of endless giving together. 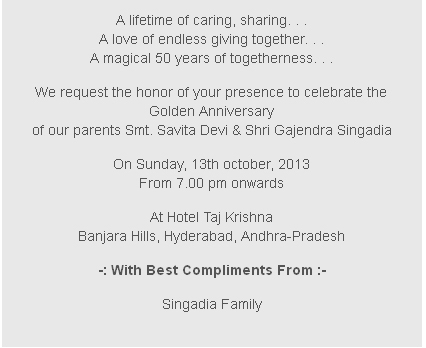 . .
A magical 50 years of togetherness. . .
Add your own personal touch in the rsvp card that you send out to your friends with our RSVP Card Wordings by only inserting your text. 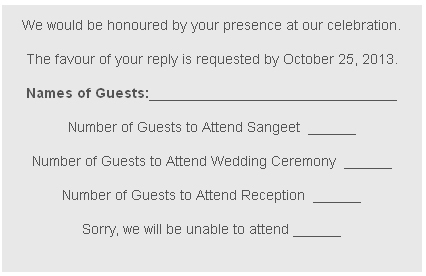 A sample of RSVP Invitation Card Wordings in English is shown below in lieu of the beautiful reply to an invitation. The favour of your reply is requested by October 25, 2013. Use these wordings as a guideline to compose your own customized text for Mehendi cards for wording. Visit us online for more information! Read our mehndi card wording samples for inspiration and ideas on thank you wording for weddings.